With no less than 16 FLESHTONE SHADES, Black Opal’s extensive range means you’re more than likely to meet your foundation soul mate. As this brand is made specifically for FleshTone beauty (and not as an afterthought), it seems to colour match your true tones without being too grey, too orange etc etc. 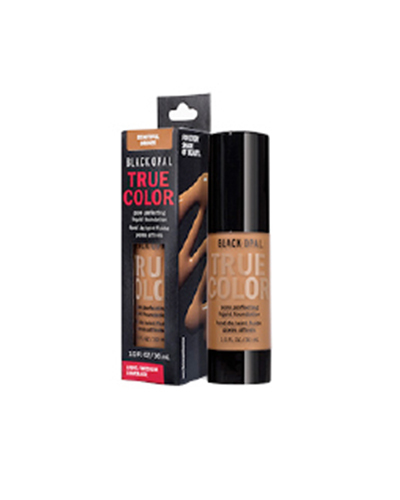 In particular, we love Black Opal’s True Color Pore Perfecting Liquid Foundation….it’s lightweight, oil free, fragrance free and paraben free. It’s also an absolute bargain! The coverage is light to medium (and it’s definitely buildable) and it really provides a skin-like finish and sets to a matte (though we recommend setting with a powder anyway to avoid any transference). Once you find your Black Opal FleshTone shade, you’ll never look back.